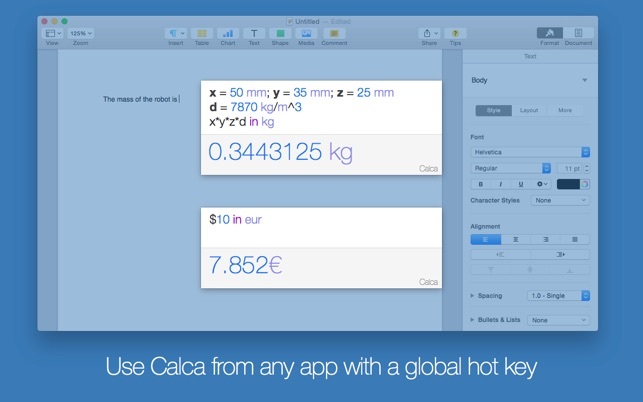 Calca is a powerful symbolic calculator that updates as you type giving you instant answers. It solves equations and simplifies complex expressions. 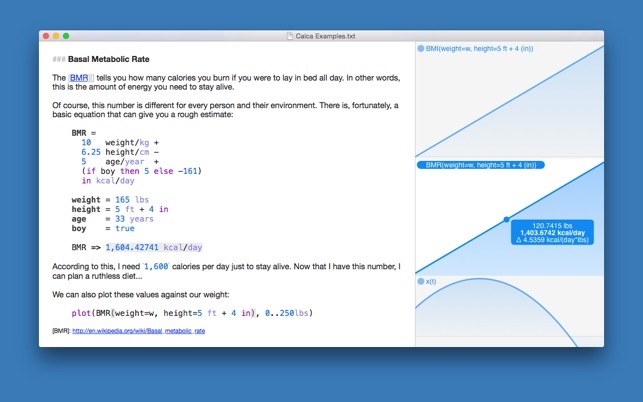 It's also a rich Markdown text editor so that you can explain your ideas alongside your calculations. 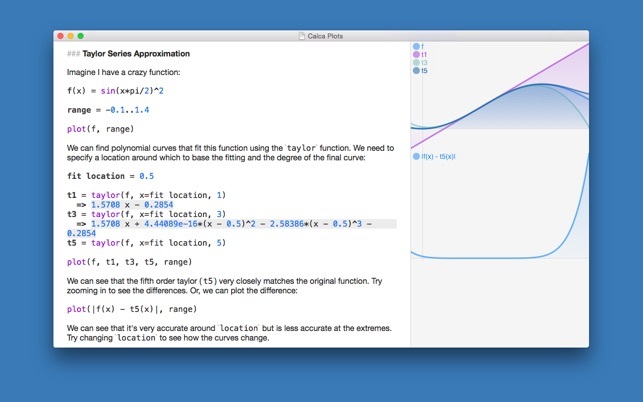 Calca is perfect for professionals and students - anyone who works with numbers and equations. Variables and functions can be created with only a few keystrokes and can be manipulated with a rich library of operators and functions. 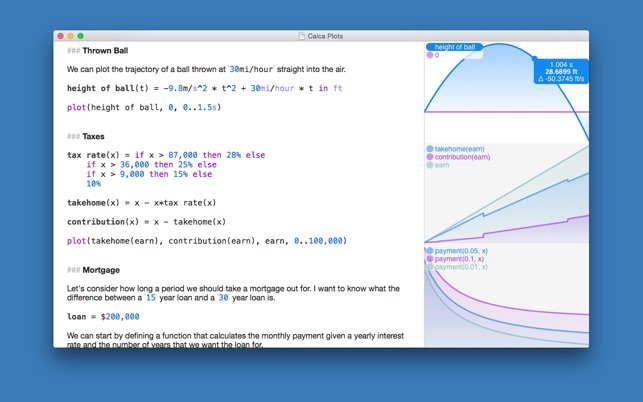 Calca updates as you type - just like a spreadsheet. You can declare variables, edit their values and watch everything update before your eyes. Since everything is calculated on the device - no network needed - you get answers instantaneously. All calculations are stored as plain text so you can easily share them with other editors and move them from device to device. Calca has been designed to work with iCloud documents so all your devices can access your calculations - you'll always have the latest files ready for viewing and editing. Calca comes with a suite of examples to help you get started covering topics from home mortgages to kinetics. All these examples are fully explained within Calca itself. Are you still using a desktop calculator? Are you using the silly calculator with the giant buttons that came with your OS? Computers are much more capable than doing simple one-line arithmetic - put your machine to work with Calca! Please visit http://calca.io to see lots of examples. Thank you for looking! Calca had already replacement most of my uses of a spreadsheet in my day to day life. But the new features on this version are just amazing. 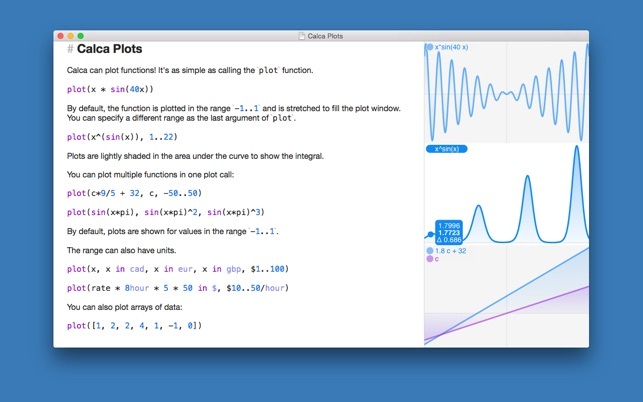 Plotting is now bulit into Calca. It is almost magical to get plots updated as you update your text and watch it live. 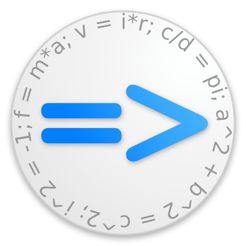 The second major feature is the use of Command-Shift-C which brings up a Calca window to do quick ccomputations anywhere. This replaces the need to have an empty Untilted file lying around in Calca for quick computations (which is what I used to do before). Now all scratch computations can be done trivially on this immediate window. I am an insulation estimator and I use this app daily. The feature that make it fit into my workflow so well is that I can save a spreadsheet as plain text in a note field on our lead management software. No other spreadsheet that I’m aware of has this capability. The only thing that could make it better for me is if it was available as a Chrome app. All of our workflow is cloud based except for this tool. However, i still very highly recommend this app as it is easy to use and has performed flawlessly. I’ve gone to sort of ambilivant on this app to very firm: this is a bad app. First of all, it does not run on my Mac at all. When I try to open it, it crashes. Second, the iPhone version fails at basic formulas. I use "Rate x Time = Distance" in my work quite a bit and I had great hope that it would help me standardize these calculations, adjusting for different units and allowing me to quickly swap out which element I knew and didn’t. IT CAN’T EVEN PERFORM THIS BASIC CALCULATION. Third, it’s missing some really basic elements. It doesn’t support conversions to mL? Making ALL of these problems worse, the developers are TOTALLY unresponsive to questions, which is difficult because the learning curve is really high and the examples don’t make a lot of sense. Forget about the philosophical question of why you need this app when you’ve already got a spreadsheet in your pocket that synches to your computer. The better question is whether you want to buy an app that doesn’t work and the developers don’t support. I don’t recomend anybody buy this. © 2013-2017 Krueger Systems, Inc.